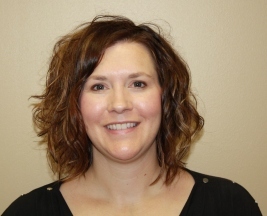 HAYS, Kan. (Nov 23, 2015) – Jessica Seib, RN, BSN at HaysMed was recently certified as an International Board Certified Lactation Consultant. International Board Certified Lactation Consultants function and contribute as members of the maternal-child health team. They provide care in a variety of settings, while making appropriate referrals to other health professionals and community support resources. Working together with mothers, families, policymakers and society, IBCLC certificants provide expert breastfeeding and lactation care, promote changes that support breastfeeding and help reduce the risks of not breastfeeding. At least 90 hours of lactation specific education that was completed as well as a minimum of 1000 hours of lactation specific clinical practice that was obtained prior to applying for the IBLCE examination. 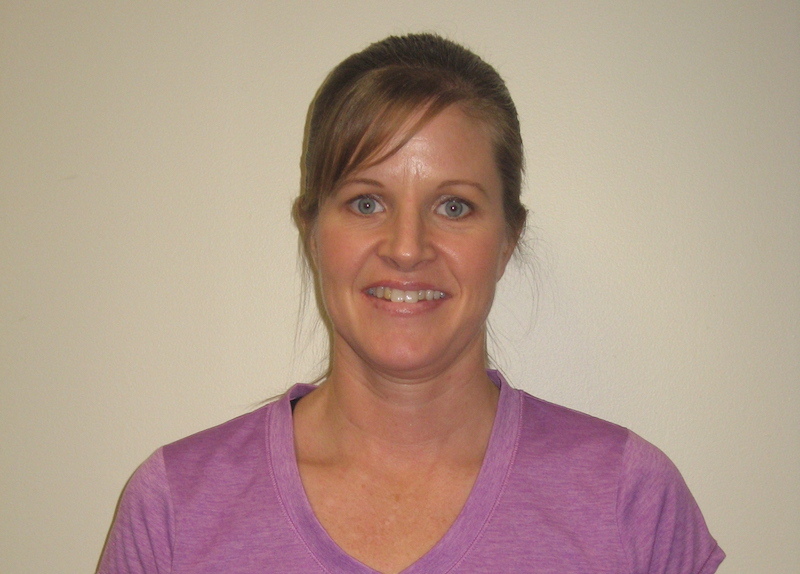 Seib is the OB/Pediatrics Staff Development Coordinator and has been with HaysMed since 2000. Since Sue Noll and her Hays Medical Center colleagues realize there are misconceptions about hospice care, they are helping organize public events to raise awareness and much-needed funds. 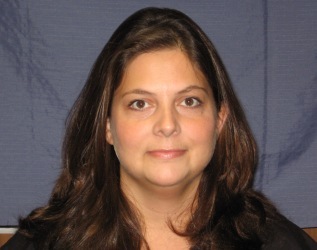 Noll is supervisor of Hospice & Palliative Care at HaysMed, which has offered services for 30 years. Its territory is Ellis, Rooks, Rush and Russell counties. “We want the community to learn more about this special care for terminally ill patients and their families,” Noll said. “Our hospice team of professionals and volunteers care for those in the last phases of an incurable disease. “Our mission is to help them live comfortably in full accordance with their values and beliefs,” she added. To relay this message, HaysMed sponsors Community Memory Trees and will participate in the Dec. 6 All American Breakfast at the American Legion. Memory trees will display brass doves etched with the name of a person being honored or remembered. They will be located in the HaysMed Miller Medical Pavilion and the Dessin Fournir building in Plainville from Nov. 23 through Jan. 4. The minimum suggested donation is $20 per dove. Request forms are available at physician clinics, HaysMed waiting rooms and at the hospital’s website – www.haysmed.com/hospice. Forms also may be requested by calling the hospice office, 785-623-6200. The special annual breakfast also will benefit families because a percentage of advance ticket prices will be earmarked for HaysMed hospice. Adult tickets are $8 or 8.50 at the door; ages 12 and under are $3.50; and ages 5 and under are free. Call the office for tickets. A craft and bake sale will be available at the breakfast too. The money raised is used locally to help the hospice team support patients and families at a difficult time, Noll said. The team includes the patient’s primary-care physician, hospice medical director, nurses, social worker, chaplain, therapists and volunteers. Services may be offered in a private home, nursing home or assisted-living center. Because the team consists of many professionals, Noll commented, hospice offers physical, spiritual and emotional care. Noll strongly encouraged anyone with questions about these services to contact their local hospice. People of any age may be eligible for hospice when their doctor estimates a life expectancy of six or fewer months and they are no longer receiving curative treatments. Medicare, KanCare and most private insurance cover hospice. “But we care for people regardless of insurance coverage,” Noll said. In addition, hospice offers inpatient care for up to five days at a time when a caregiver needs a break. The supervisor noted that volunteers receive training and on-going education. They visit patients and run errands, and help with bereavement, fund-raising activities and other services. The staff is available for community presentations about services, end-of-life issues, advance directives and grief. What are your fitness goals for 2015? I would like to lose weight and get more toned throughout my body. I have plans to work with a personal trainer this winter. I attend the 5:30 evening class Monday-Thursday and try to attend most of the Variety classes on Saturdays. I try to run at least 2 miles a week when my schedule allows me to stay longer after the evening class. Just knowing that I feel so much better and have more energy when I workout. I feel guilty if I miss a workout. I participated in the Pair Up – Double Down Program at The Center in March of this year and lost 20 pounds. I plan on continuing to work hard to keep it off. 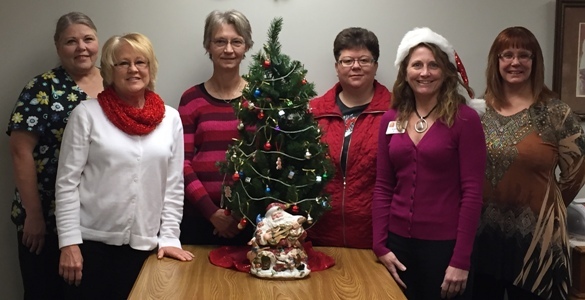 HAYS, Kan. (Nov 16, 2015) – The Volunteers at HaysMed are hosting their annual Holiday Open House at the Corner Gift Shop located in the hospital. The event is scheduled on Sunday, November 22 from 1:00 pm to 5:00 pm. All Christmas Items are twenty five percent off their regular price. 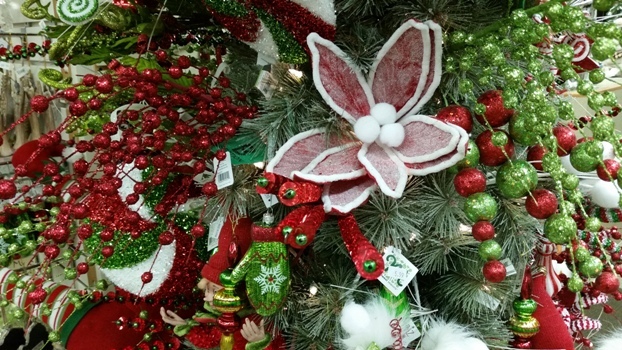 They have a large variety of holiday décor including ornaments, tree and home decorations, stocking stuffers and gifts. They also carry purses, jewelry and accessories, body lotion and a large selection of Willow Tree® figures. The Corner Gift Shop is staffed by the hospital volunteers and all proceeds from sales benefit Hays Medical Center projects. Hays – The HaysMed Foundation has received a distribution from the William F. and Joanna L Aubel Charitable Remainder Unitrust. The gift of $217,122 will be added to the Bill and Joanna Aubel Endowment. The endowment is a permanent fund in which the earnings will benefit the Dreiling/Schmidt Cancer Institute at HaysMed. For more information on how to include HaysMed in an estate, contact the HaysMed Foundation at (785) 623-2350, email ruth.heffel@haysmed.com or visit the Foundation website at www.haysmedfoundation.org. 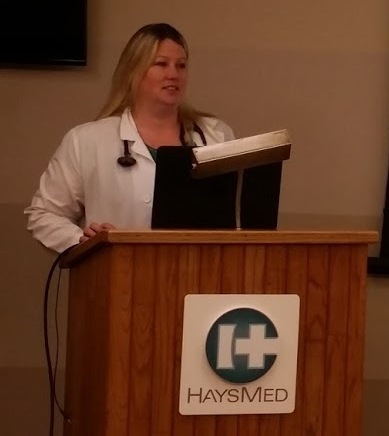 HAYS, Kan. (Nov 10, 2015) – The HaysMed Sexual Assault Nurse Examiner (SANE) program congratulates three nurses on their newly earned board certifications! Susan Smith, RN, BSN and Allison Jones, RN have earned the credential of SANE-A (Adult/Adolescent), and Jessica Albers, RN, BSN, MFS, SANE-A has earned the credential of SANE-P (Pediatric). Smith and Jones are nurses in the Emergency Department and the SANE team and Albers is the SANE Team Leader. 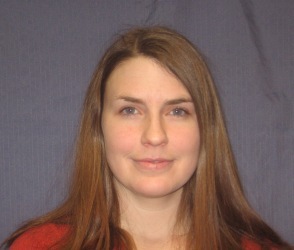 Smith has been employed at HaysMed since 2000, Jones since 2010 and Albers since 2001. HaysMed now has a total of six nurses certified in SANE and one in training. Credentialing is issued through the Commission for Forensic Nursing Certification. The earned credentials of SANE-A® and SANE-P® designate that the recipient has achieved the highest standards of forensic nursing for sexual assault nurse examiners. Nurse examiners become certified by meeting the eligibility requirements, which include 300 practice hours in the specialty, and achieving a passing score on the certification examination. Smith, Jones and Albers join the ranks of 26 Kansas nurses credentialed in SANE-A, and 11 Kansas nurses credentialed in SANE-P. This announcement of achievement for the HaysMed SANE Team is further accentuated by the coinciding celebration of Forensic Nurses Week, which is held November 9-13. Forensic Nurses Week is organized by the International Association of Forensic Nurses, a nursing association representing more than 3,300 registered nurses, death investigators, other forensic medical professionals, correctional officers, and law enforcement in over 24 countries. A forensic nurse is a nurse who provides specialized care for patients who are victims and/or perpetrators of trauma (both intentional and unintentional). Forensic Nurses are NURSES first and foremost. However, the specialized role of forensic nurses goes far beyond medical care; forensic nurses also have a specialized knowledge of the legal system and skills in injury identification, evaluation and documentation. After attending to a patient’s immediate medical needs, a forensic nurse often collects evidence, provides medical testimony in court, and consults with legal authorities. Forensic Nurses at HaysMed conduct medical-legal examinations for victims and perpetrators of sexual assault, child abuse and domestic violence victims. The team currently has six trained SANE nurses and one in training. Show your support by joining HaysMed on Friday, November 13th by wearing lilac- the designated color of forensic nursing- to commemorate the expertise and commitment of the HaysMed SANE Team! For more information contact Jessica Albers, HaysMed SANE Team Leader at 785-261-7123 or jessica-albers@haysmed.com. Hays, Kansas (Nov 4, 2015) – The next session of Coffee and Conversation will be held Wednesday, November 11, at the Hays Orthopedic Lobby, 2500 Canterbury Drive, Hays Kansas. Participants are asked to use the West Entrance. leads a recent Diabetes Solutions class at the hospital. Those with diabetes can get a jump on a New Year’s resolution by signing up for educational classes to help them manage their disease. Hays Medical Center and Pawnee Valley Community Hospital (PVCH) in Larned offer Diabetes Solutions from January through November. 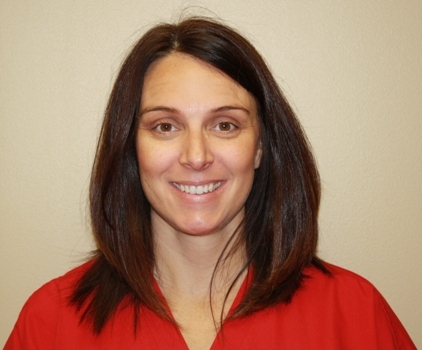 The time commitment involved is only two Tuesdays during one of those months, said Tara Roa, HaysMed physician assistant. Roa noted that classes are scheduled for each month at Hays and every other month in Larned. The hospitals are partners and share resources. “The goal of Diabetes Solutions is for participants to become active in their own care and diabetes management,” Roa said. “We want to provide avenues to success in achieving their health-care goals. The classes are scheduled for 8:45 a.m. to 2:30 p.m. on the first and second Tuesdays of the month; a healthy lunch is included. Diabetes Solutions is an American Diabetes Association-accredited program. Class topics include: defining diabetes; eating a healthy diet; being active; monitoring test results; reducing risks; problem solving; taking medications; and healthy coping. Anyone with pre-diabetes, or Type 1 or Type 2 diabetes, is encouraged to attend. A doctor’s referral is necessary. For more information, call 785-623-5500. HAYS, Kan. (Nov. 3, 2015) – HaysMed Hospice once again will be sponsoring a Community Memory Tree. With the holiday season approaching you can honor someone special in your life by donating $20 to the HaysMed Hospice. A brass dove ornament will be then be engraved with the name of the person you are honoring or remembering. 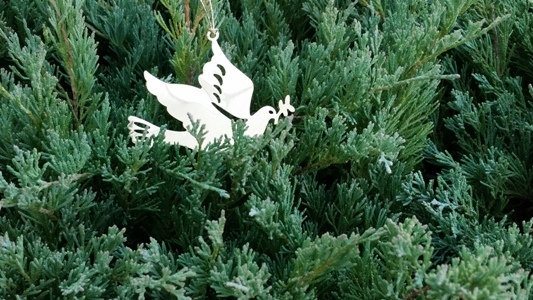 The doves will be placed on one of two trees located at the Miller Medical Pavilion at HaysMed and in the Dessin Fournir building at 308 W. Mill in Plainville. For over 30 years, Hospice at HaysMed has lit the community and the surrounding area with hope, comfort and understanding for the terminally ill and their families. Donations enhance the resources available for education, support the volunteer and bereavement programs in their entirety and cover patient-related expenses not paid for by insurances. Contributions are tax deductible to the extent allowed by law. The Memory Tree form is available at https://www.haysmed.com/hospice/. For more information contact the HaysMed Hospice at 623-6200. 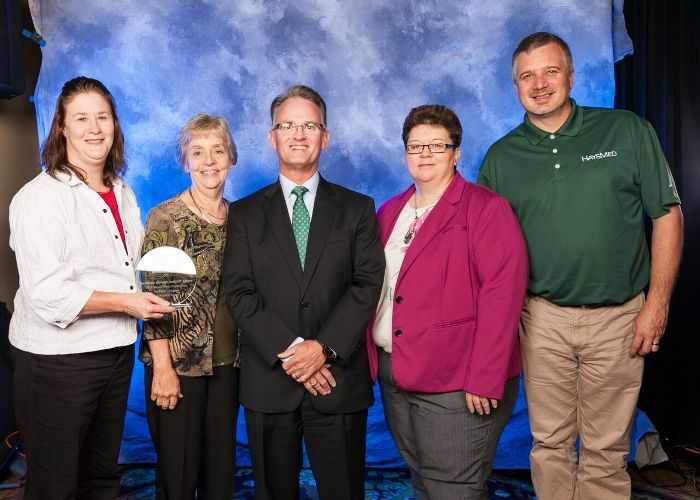 (Hays, KS – Nov 2, 2015) – HaysMed was recently recognized with an Excellence through Insight award for patient experience by HealthStream, Inc. (NASDAQ: HSTM). The unit specific award recognized the Bone, Joint and Spine Center in the hospital which also encompasses staff from the HaysMed Orthopedic Institute and Rehabilitation. HaysMed was awarded this honor for their commitment to excellence in patient care. To qualify for an award, a hospital must have been a patient satisfaction-tracking client of HealthStream in 2014, scored in the 75th percentile or higher, and surveyed a minimum of 100 patients. HaysMed was chosen for receiving the highest ratings in hospital unit specific patient experience from among HealthStream’s 1,200 plus clients, as well as for exceeding industry standards. HealthStream is the research firm HaysMed contracts with to conduct the government required Consumer Assessment of Healthcare Providers and Systems (CAHPS) surveys on patient experience. The CAHPS survey is the first national, standardized, publicly reported survey of patients’ perspectives of hospital and clinic care.